As far back as I can remember I’ve supported Real Madrid. Los blancos. Los merengues. Los vikingos. Support for this team runs deep in my family, going all the way back to before the Spanish Civil War, and persisting in my father’s staunchly Republican household despite the grip of Franco’s regime. It followed my family to Algeciras to Melilla to Tangier to Madrid to Caracas and back to Spain; and it followed my father to the United States. The author, age 9, after scoring the goal to win Real Madrid's 7th Champions League (Parque del Retiro, c. 1996). “Football—it’s a religion here” says every Brazilian on every ESPN spot about some upcoming tournament. Sure, it can be—it seems to be passed down, essentially, from generation to generation, gaining converts over time as individuals and even nations evangelize their particular variations of the game. National teams are tied into a vision of civic nationalism, a sort of national religion, that is an interesting subject for a different article. Club teams, on the other hand, those specifically local yet ambiguously international entities, the ones that somehow carry that moral heft associated with local historical pride while explaining that the doubling of ticket prices somehow will benefit this nebulous concept of “the fans”—these teams are brands, international conglomerates with a profit motive, which have leveraged their evolution from local socio-political entities to create and demand brand loyalty and retain customers. OK, clubs aren’t exactly brands. Well, rather, these teams haven’t always been brands. Sure, sports teams die like brands—they fold economically, their image gets tainted, they get relegated, and fans move on to other teams, other leagues, other sports and interests entirely. But there’s something deeper in our relationship with sports teams than our relationship with brands; for many, teams run in families and communities, the ties to the place, the shirt, the emotions are part of the social fabric that binds us together. At their most basic, sports were invented simply as a way of having fun in a group—and that dynamic, at its core, is not the same as the profit motive that drives a capital-creating enterprise. Take Association Football. It started off, let’s say, as a way of making it possible for people to have fun with their friends, in an organized sort of way. As leagues and teams sprang up across the world, a common set of rules emerged—rules are, again fundamentally, a common vocabulary by which a group outlines the mechanism of its fun (or constrains others’ fun when it impinges too savagely on the pleasures or interests of a more influential subgroup). This set of universal rules allowed groups across continents to agree on a common language by which, should they ever meet, they could communicate. These rules also expanded the universe of people who might not want to participate in the active element of the sport but could still participate in the passive elements of the sport. The universalizing of the rules of the game, to return to the example, expanded Association Football from a group of people running around having fun to a group of people running around having fun with a group of people having fun watching them. George Best playing for Hibernian of Edinburgh, the first Scottish side to use a kit sponsor--Greater Manchester area sports apparel company Bukta. I’m not saying that we should romanticize the halcyon days of community sport. There never were such days, and we don’t need to transport ourselves back to the time of huge unicycles, violent colonial racism, casual alcoholism and “you knock me out, red” sexism. But somewhere along the line, in the long nightmare of history, club teams embraced modern corporatist capitalism and began to mold themselves into international profit-seeking conglomerates; fans were duped, suckered, scammed into missing this basic transformation, the crises it induces and the value it extracts from them. Nothing exemplifies this transformation better than the two giants of Spanish soccer, Real Madrid and FC Barcelona. Both clubs were formed around the same time, before the second Spanish Republic, before the Civil War and the dictatorship. To this day, fans still spout off about the history of the two clubs—how Real Madrid brought a vision of attacking soccer to a still-divided Europe, winning the newly-created European Cup over and over; how the club conducts itself with honor and señorío; how winning is a religion and a curse. They’ll recall how Barcelona’s Nou Camp became a bastion of political resistance during the dictatorship, més que un club in a real sense, and how the team of Laudrup and Guardiola and Messi has continuously reinvented the game. And, more than anything these fans talk about, more than the endless debates about Cristiano Ronaldo and Lionel Messi, at the beating heart of this rivalry—and of sports generally—is a sense that support for your club is a moral matter. Real Madrid fans aren’t just rivals, they’re bad people; Culés aren’t just supporting a club from a different area, they’re morally wrong. And clubs use this devotion as a way of cleaning up their brand identity. And this is why fans who concoct absolutely absurd retellings of history as a way of explaining their club’s (or their club’s players in some noxious cases) misdeeds ultimately are both justifying their fandoms morally and helping launder the club’s image as they continue their evangelical progress. Juventus wasn’t relegated because its board members engaged in a multi-year conspiracy to rig the Italian league: they were framed, no criminal charges were brought, the UEFA investigators had it out for them—it’s all just fake news. Real Madrid wasn’t used as a tool of soft power by Franco! Hitler wasn’t a fan of Schalke, he was a fan of Nuremberg, of Bayern, of Hertha! Barcelona’s relationship with Qatar is charitable! And, in arguably the worst cases, “this player didn’t abuse his spouse, actually that story was fake, she didn’t file a report, everyone speaking out is lying”. The point that the clubs understand and that modern fans don’t is that these debates simply don’t matter. That is to say—sports are political, of course, and the actions of teams, fanbases and players are all political. Modern political discussions between human beings about the historical legacy of clubs can serve as proxy discussions of modern political issues (see, for example, how the fight over Catalan nationalism has been projected onto sporting loyalties in Spain). However, the governing politics of modern sports is the politics of global capitalism. Clubs recognize that the historical discussions between fans serve the broad agenda of supporting global capitalism by wedding identity and loyalty to their capital-producing enterprises. Clubs use these discussions, this history, this almost genetic, religious loyalty to create and cement their individual brands: FC Barcelona is més que un club; Real Madrid has a tradition of victorious greatness and class—señorío. Importantly, fan loyalties are contributing a huge amount of value to these clubs in addition to the strict line items of ticket and jersey sales—a club without fans in the stadium and “local color” has no value for TV audiences. 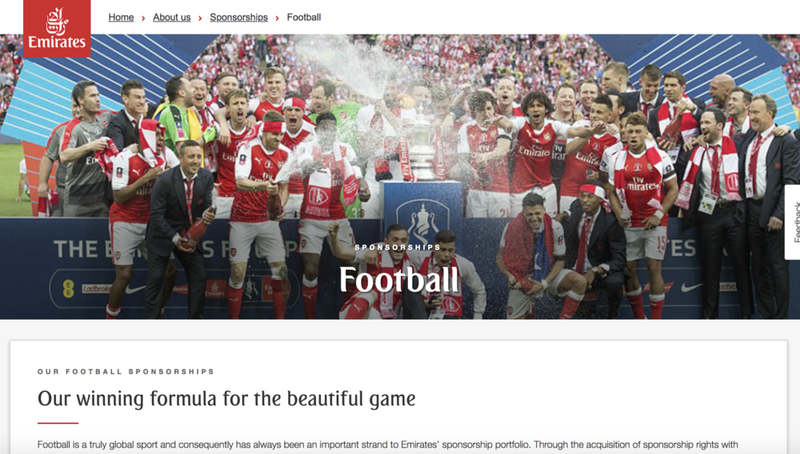 If the club itself has become a brand, the fans are necessarily part of that brand. Clubs which were once deeply entrenched into the local socio-political culture and history of a region now use that history to chase fans all over the world in search of higher revenues. In Spain in particular, modern fans still express regional identity (and the culture and politics which come with it) through their club allegiances—and regional rivalries that have their origin as far back as the Reconquista have now become selling points for clubs pitching to global media organizations. But it’s not just the match that is being sold abroad—what the clubs are selling to the global media are their fans’ identities, their passions and aspirations. What was once a local affair is now being packaged and sold abroad—with no compensation to the people who actually drive this value. 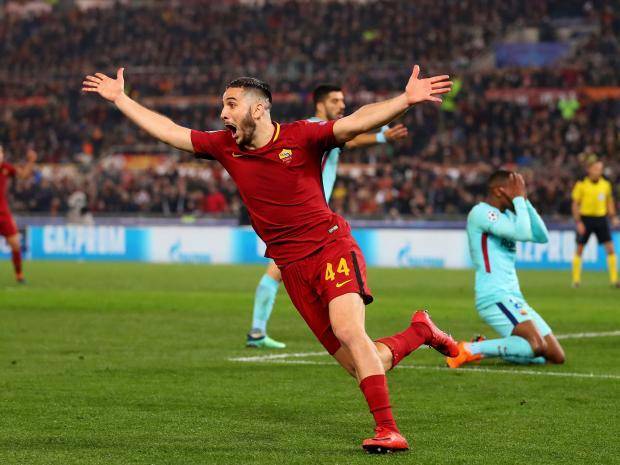 Here's the kit Roma wore when upsetting Barcelona in the Champions League quarterfinals. This may be because many fans see their loyalties as moral, tribal, even religious; while clubs see these loyalties the only way capital-creating entities driven by a profit motive can see them—as money. The most obvious example of this value extraction (based in the difference between how fans see their loyalties to the clubs and how the clubs see fan loyalties) occurs when clubs act in ways that are antithetical to the regional, historical socio-political identities upon which they were built—while still proudly championing their brand to the joy of their fan-consumers. FC Barcelona signs a sponsorship deal with the government of Qatar, who are currently building World Cup stadiums with slave labor; the team management refuses to forfeit a match during the Catalan referendum, despite the side’s historic relationship to the notion of Catalan identity. 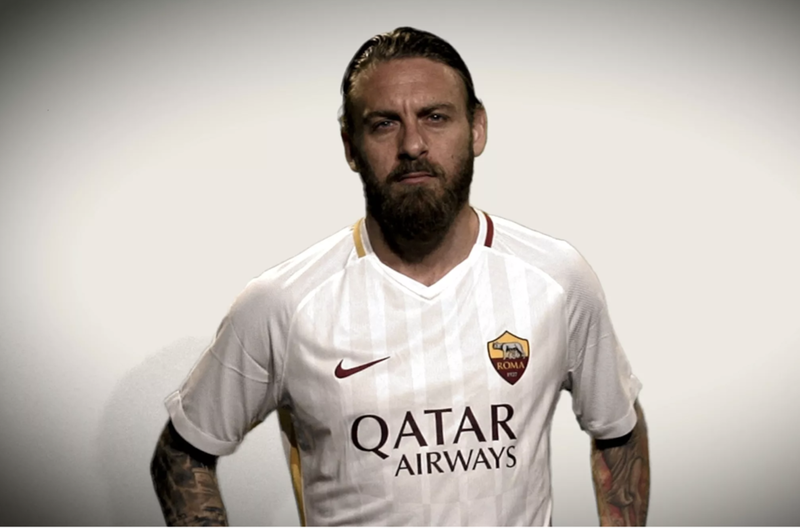 Just recently, AS Roma revealed a major new sponsorship deal with the Qatari government on the eve of their Champions League semifinal trip to Anfield to swelling, up-tempo orchestral music meant to evoke the tradition and pride of the fanbase—even though the new shirt, sponsorship wildly obvious on the front, supplants the far more traditional AS Roma kit which had no shirt sponsor. Real Madrid did the same in the early aughts, supplanting their sponsor-less white kits with an advertisement for a gambling website (now sponsored by the government of the UAE). Señorío indeed. Roma debuted this kit before traveling to Anfield and getting thrashed by Liverpool in the Champions League Semi-finals. The modern fan has become blind to these crises in favor of reinforcing their own position in the moral discourse of sport—a discourse which has, in many cases supplanted the purely political as a realm of discussing baseline ethical dilemmas. In this new world global corporations and global clubs have a lot in common: both build a brand based on a semi-fabricated, idealized history and promote that brand to customers in the hope of creating a loyal following that will evangelize their product to others. Each link in the chain creates more capital. Each new fan is another sack of gold with a dollar sign. The notion of the club as a regional, socio-political entity has become as outdated for the regular fan as the notion of the “good” corporation that “cares” about its workers. The slogans for one ring as hollow as the slogans for the other. “Més que un club” may once have rung true; now, it is as meaningless and vapid as “better ingredients, better pizza”. These clubs aren’t your friends. Clubs have become international brands, profit-chasing conglomerates that make money off of the memories of the regional, socio-political entities from which they evolved—so yes, these brands are not your friends. But that reality of late-stage capitalism doesn’t have to be paralyzing or render the relationships and community fans can create under the color of these brands meaningless. In fact, this realization can be liberating because it stands directly in contrast with the vision of our collective humanity (or lack thereof) that has evolved under neoliberal capitalism—that we are atomized individuals that exist to make Pareto-efficient choices in The Market (of what? EVERYTHING!). “And, you know,” Margaret Thatcher said, “there is no such thing as society. There are individual men and women, and there are families.” And there are brands that compete to sell products to those men and women. And free men and free women make their individual choices in this market and the good brands survive and grow and the bad brands suffer and die—just like the good people and the bad people. This is the neoliberal capitalist subject. Sports clubs have become brands and commodities to be hawked: the realization can be liberating, because it frees fans from the sort of tribal loyalty these clubs thrive on. That is, when you realize that your team has embraced its status as a profit-seeking entity trying to sell you a product (and trying to manufacture you into the sort of consumer who buys that product), you realize both (1) that it is no longer an embodiment of your community and a standard-setter for socio-political discourse, as clubs may once have been; and (2) that you can exert a sort of political agency by leveraging your own relationships with other fans that you have built over time—you can create a quasi-society based on this long-dead regional entity. Realizing that the club has become a brand should not stop the fan from forming the sort of social bonds and community ties that we are told the neoliberal subject should eschew. Fans can take the evolution of the regional socio-political club into international conglomerate, and re-center the political conversation back on local political and cultural issues. Take, for example, three different instances where fans have rallied together to form tight-knit socio-political groups under the auspices of fandom which actively challenge the club-brand. For much of the modern history of association football, the sport has been plagued by different types of fan violence: in England, famously, so-called hooligans (the etymology of which is contested, but likely refers to violent late 19th gangs of young men, so called “Hooligan Boys”) terrorized the sport throughout the 1970s and 80’s. In Spain and other leagues in Europe, the hooligan phenomenon was often tied to politically right-wing regional fascist groups which came to be known as “Ultras”. And Real Madrid was no exception—the southern stand of the Bernabéu was, even in my youth, dedicated to the “Ultras Sur”, the “Southern Ultras”. Europe is going through a severe financial crisis and there are a lot of people out there who rely on the sport to provide happiness for them. Some of them insult the players on Twitter but others take it one step further because of their extreme ideology. I believe that it is quite difficult to eradicate these groups because of certain trends in European culture. If this ideology is present in our society, it will be present in football as well. Javi’s actions in response to what he—correctly—recognized as a rising political tide of fascism was to organize. And he did that by recruiting the people he knew, the friends—and acquaintances—he had met under the umbrella of this corporate brand to respond to this political problem with a political solution. In Javi’s case, Real Madrid the brand, the international conglomerate, would never have made any changes absent sustained pressure from inside what they see as their core consumer base. Javi leveraged Real Madrid’s need to have an engaged local fanbase for the political end of ridding their stadium of fascists—Real Madrid’s board finally agreed and revoked every season ticket from every single Ultra Sur. This is what I mean when I say fans can use the bonds they create under the auspices of these conglomerates to create meaningful political change on the local level. Did Javi Marcos and Grada Fans RMCF rid Spain of fascism? No, of course not; but they did come together to demand a space within the umbrella of this uncaring profit-driven corporation that is free from fascist violence—a communal, social space created through targeted local action. In late October 2017 news broke that the owner of the MLS side the Columbus Crew—one of the original founding franchises of the American league—intended to relocate the franchise to Austin, Texas. The idea of a franchise relocation is completely absurd to most European soccer fans precisely because of the evolution of their club franchises from regional socio-political entities. How could Real Madrid leave Madrid? It’s an absurdity. But in the United States there is a long, long tradition of franchise relocation—and this history is, in part, instructive on how modern fans can survive the corporatization of sport. When Morgan Hughes first heard the news that Precourt and his venture capital firm Precourt Sports Ventures planned to relocate their asset to Texas he froze—in a story he has told numerous times, he walked down his hall past Crew memorabilia he had collected, photos of earlier teams, signed gear. Defeated, he walked in circles—like a piece of him had been cut away. All of those moments will be lost, as Roy Batty lamented, like tears in rain. Over the previous few days Morgan had been chatting with a number of his Crew diehard fans in a group DM. Their general anger and despair eventually transformed into a deep determination to prevent this move from happening. Despite the Crew’s limited (by European standards) history, fans like Morgan had already formed deep social ties to other members of their community based on their shared love of this team. Sure, as Ohioans they knew first-hand that American sports franchises were primarily corporate profit engines—billionaire owner Art Modell had relocated the Browns of the National Football League to Baltimore only about twenty years earlier. Most importantly, they also accepted, perhaps not on a conscious level exactly (as they rarely talk about this in their public remarks), that the crises presented by clubs-as-brands are political crises with political solutions. The Crew has social roots in Columbus and in Ohio; to move it from Ohio can be called a “business decision,” but for the communities the club has helped create it is a deeply, undisputedly political action. And political actions can be met with political force. The #SaveTheCrew movement began in Morgan Hughes’ circle of Crew supporters but expanded across the country virally. Supporters created local actions and developed lobbying strategies reminiscent of seasoned political veterans. The Ohio Attorney General sued the owner and venture capital firm under Ohio state law to try to force the franchise to remain in Ohio. The Crew is a brand, a commodity or asset that can be relocated and refurbished; what the #SaveTheCrew movement shows, I think, is that fans, when freed from the (to use a term of art) false consciousness of the neoliberal subject, understand that all action taken in service of capital is political action—and that action can always be met with a political response. FC Barcelona evolved, as I mentioned, as a regional club with a socio-political identity deeply tied to its Catalan roots. It adopted Catalan as the club’s primary language prior to the Second Republic and remained one of the few places in the country where the language could be spoken openly under Francisco Franco’s fascist dictatorship. However, the team itself is no longer tethered to this regional identity—it proudly flaunts its relationship with brutally oppressive regimes, rendering, as I said, its “mes que un club” as meaningless as “better ingredients, better pizza”. In the most important example of this evolution, FC Barcelona chose to play a match the day that the Catalan parliament had called a referendum to determine whether it would declare independence from Spain. Why the club chose to play the match is essentially immaterial; the baseline point is that Catalan independence would be a complete disaster for FC Barcelona the corporate entity. They would lose millions. Their tepid response to the largest Catalan independence movement in my lifetime is indication enough of the club’s transformation into a corporate behemoth. However, this has not stopped FC Barcelona’s devoted fans from loudly and proudly displaying their support for independence—damn the consequences. These fans are united by their support for FC Barcelona, despite the club’s behavior during the independence struggle. And the fans are using this common social bond to organize political struggle even though it hurts their club. When Juventus visited Barcelona in early September 2017, a few weeks prior to the Catalan independence referendum (which had been declared illegal by the Rajoy regime in Madrid), independence supporters hung a massive tifo from the rafters of the Nou Camp: “Benvenuti Nella Repubblica Catalana" (Welcome To The Catalan Republic). This banner violated UEFA rules. It violated Spanish rules. It cost FC Barcelona money. But the fans used it as a rallying cry to serve a political end that they viewed as greater than the club itself. This, to me, is another example of the liberating realization that clubs have become international brands. Because so many people around the world share in the spectacle these brands have become, devoted local fans can come together to demand political action by riding on the brand’s massive popularity. The club’s lukewarm response to the push for Catalan nationalism may have been disappointing to its fans; but that did not stop them from using the brand’s popularity to take political action. If the neoliberal subject is a consumer blandly devoted to a brand without social ties, then the liberated fan can recognize that actions taken in service of a greater political end that use the popularity of the brand itself can reach those who might not otherwise take their aims seriously. Previously, this had mainly been the domain of the players—heroes like Colin Kaepernick who use their brand’s platform to speak out against social ills. But fans can, and should, use their club’s brand as a platform to respond not just to local issues but also to larger-scale political actions.